Home/ SHOP OUR STOCK/ Perimeter Grounding (HALO)/.25" x 4" Perimeter Grounding/ Halo Ground Ring 90 Degree Elbow .25" x 4.00"
Halo Ground Ring 90 Degree Elbow .25" x 4.00"
.25" x 2.00" perimeter grounding 90 degree corner elbow. 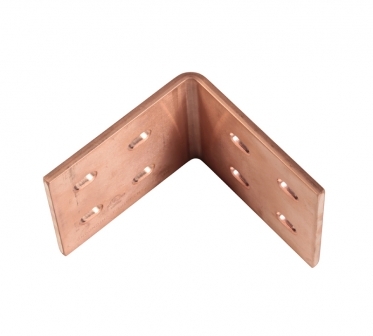 Copper Elbow - 90 Degree - Mounted Directly to Ground Bus .250" Thick x 4.00" Wide - Hole Pattern "R", Alloy C110 Meets ASTM B-187, Square Edge. 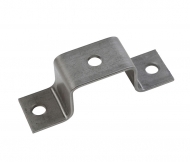 Mounting bracket for ground bars. Use 3/8" bolt on center hole. 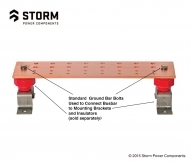 Mounting bracket for ground bars. Use 5/8" bolt on center hole.